Non-Smoking, two bedroom, two bath, luxurious Condo at Pointe Santo complete with all modern appliances and conveniences. Great views from this third floor unit of the Gulf of Mexico as well as the beautiful lush island landscape including a fresh water lake. Just steps from the greatest shelling beach in the USA. 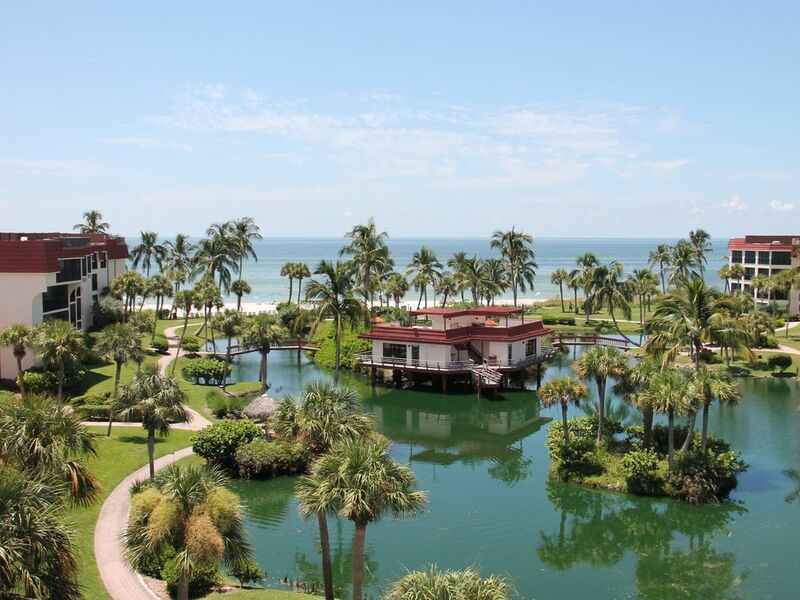 This is definitely the most beautiful condo complex on Sanibel Island. If you do not see we are available, check with us anyway because we are members of a referral group at Pointe Santo and we will pass your inquiry on to others. Hello: We are Gordon and Mary Katherine Wells from Hoschton, GA in the Atlanta far NE suburban area. Gordon is a retired Research and Development Director with a PhD in Food Science from Michigan State University. Mary Katherine (everyone calls her MK)attended the University of Florida and is an active homemaker who manages our two vacation homes and our residence on Lake Lanier. We are very active in our church here; have 15 grandchildren to keep us busy; love to travel to far away places; enjoy golf, friends, eating out and our mountain home in NC and of course - Sanibel. We keep our vacation homes updated with the latest furnishings and are particular about their tidiness and cleanliness. Many friends and missionaries stay with us on a regular basis. So we guess hospitality must be one of our gifts. We had been coming to Sanibel for many years, renting at different locations. We decided that since we loved Sanibel so much , we would buy a unit for our use and share it with our children and then rent it when we were not there. We looked all over the Island but found Pointe Santo to be the most beautiful and most family friendly plus it was close to everything. At Pointe Santo we enjoy the large expansive beach, pool and hot tub, and roaming the beautiful palm studded grounds with all of the flowering bushes and flowers. We enjoy the activities at the clubhouse and the people who are so friendly here. We have free Internet and love to ride our bikes all over. Sometimes we just sit on our screened balcony. From the 3rd floor, we can really enjoy the view of the ocean and grounds and the quietness of our end unit. When we retire for the evening, we often open the glass sliders in the Master Bedroom so we can hear the sound of the waves hitting the beach. Heated Pool, Tennis Courts, Hot Tub, Beach Volleyball, Activity Clubhose, Free Internet, Free Computer Usage and Printing, children's Programs,Reserved Parking. We have several palm trees between us and the peach but no other buildings blocking our view. We are set back about 100 yards but we still have a great beach view. The fresh water lake is more like a pond in size but is greatly appreciated from our third floor location. Turtles, fish and an occassional small aligator can often be seen especially when strolling the perimeter. We have several palm trees between us and the beach but no other buildings blocking our view. We are set back about 100 yards but we still have a great beach view. keurig and Mr Coffee maker. Microwave, dishwasher, blender, toaster, garbage disposer, deluxe coffee maker, keurig , crock pot, fully equipped with cooking dishes, pots and pans, glasses, silverware, etc. HD LCD TV in Master Bedroom. HD LCD in guest bedroom and large HD LCD TV in Living Room. Several DVD's and VCR's available. We have 2 bicycles for the free use of our guests and our resort has a full time children's activities director. The private outside beach closet is equipped with beach chairs, umbrellas, toys, floats, fishing gear, etc. to make your beach time most enjoyable.